The dispersion of hedge fund returns varies by strategy and manager. The returns of global macro funds can vary a lot, the returns of trend followers tend not to. The returns of funds of hedge funds are in a tighter cluster than just about any sub-strategy of single-manager hedge funds. So it is always intriguing to find an outlier. SkyBridge Capital’s funds of funds are such an outlier. The returns of the flagship SkyBridge Multi-adviser Hedge Fund Portfolios LLC Series G are shown in Table 1 along with the returns of the Barclay Fund of Funds Index. There was a whisper in the data point for 2007 that something different was going on at the firm that produced this return series, but the returns post-credit crunch shout it out. 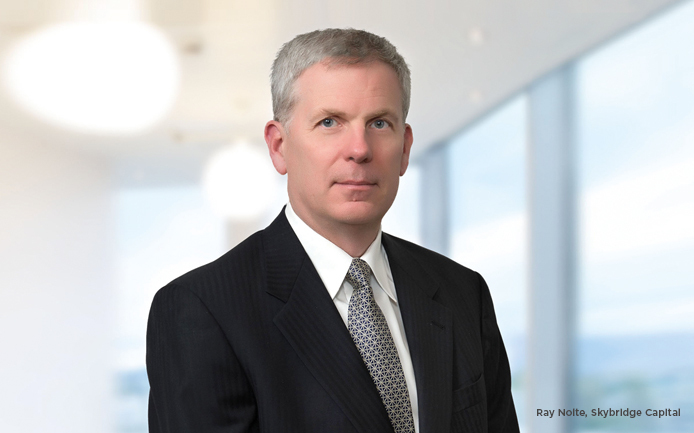 The Hedge Fund Journal spoke to the chief investment officer of SkyBridge Capital, Ray Nolte, to find out what has gone into producing this performance difference. Nolte describes what SkyBridge’s multi-manager business is doing as “fund of funds, version 3.0”. Thefirst version of running a fund of funds was simply getting access to the big names of the time – the likes of Soros, Tudor, Moore Capital and Tiger. With increasing institutionalization in the late ‘90s this morphed into version 2.0, wherein the portfolio of funds was run in a way analogous to how long-only mandates were granted. There were targets for returns and volatility and a series of portfolio construction constraints. “In version 2.0 there were typically 50 holdings of hedge funds, most of which have a 2% weighting,” describes Nolte. If the manager likes a hedge fund the weighting might be 3% or 4%, and allocations might be 0.5% or 1% for a nascent manager or one where the timing of the strategy is not quite right. In this framework, which Nolte thinks is still the dominant model today for his competitors, a strategy weighting might vary by 5% or 10%, but all the changes are small and there is little opinion-taking. In Ray Nolte’s story as an investor in hedge funds, 2005 was the turning point. Up to then, at Bankers Trust/Deutsche Bank, he followed the fund of funds 2.0 model. But when he was approached to head up the alternatives business of Citigroup he took the opportunity to do something different. The environment for the industry had changed – hedge funds were becoming more mainstream, and the efficiency of markets was increasing for hedge fund strategies. Given the amount of capital thrown at hedge funds, Nolte’s musings led him to believe that returns would be lower than previously. Citi had had some lacklustre performance and staff turnover so there was a department which was ripe for change. Nolte’s view was that the size of the Citi fund of hedge funds business was too small to play catch-up to the larger players like Blackrock by playing the same game. He decided that he had to try to add more value than those operating fund of funds 2.0 in order to create something that was more compelling to potential investors. The model operated then by Citi (and now by SkyBridge) was to be thematic, dynamic and opportunistic in running portfolios of hedge funds. By expressing high-conviction investment ideas in the funds of funds portfolios there would be a chance to make better returns and grab investor attention. “I took the opportunity to make some important hires and re-structure the business,” explains the CIO. The Citi fund of funds business under Nolte was turned around, gaining assets and getting commercial traction. However, post the credit crunch, the Citi name was not what it was, and the business had branding and marketing issues. With the agreement of senior management at Citi, Nolte looked for a partner to help with a management buy-out of his business unit. He already knew Anthony Scaramucci, the SkyBridge CEO. It seemed (and proved) a great combination – the 23-man investment team from Citi brought the in-depth knowledge of hedge funds and their strategies, and SkyBridge had marketing expertise. The merger of talents took place in June 2010. Under Nolte’s model of running a fund of hedge funds (“version 3.0”) there has to be flexibility. There have to be guidelines, since they are a comfort to the investors, but there also has to be some freedom of movement. Although a high-conviction theme tends to be expressed in the portfolio through the allocation of capital, it can also be through the absence of capital in a strategy. “Sometimes not having money in something can be a theme as much as committing a lot of capital,” Nolte shares. A current example of a bet in absentia is in macro – SkyBridge currently have no capital in global macro managers. In SkyBridge Capital funds there cannot be more than 40% of the portfolio in a given theme or investment idea. But that should be implemented in a way that does not give binary outcomes – that is, where 40% of the portfolio goes up or down on the back of a single event. “We look for multiple ways to express a theme, and allocate to that theme with a number of different approaches. At the manager level we can go up to 10% of NAV at cost. The highest we have experienced to date is 12-13% at market,” Nolte adds. The portfolios at SkyBridge Capital are built around the usual three targets: returns, volatility and correlation. Portfolio returns should have low correlation to equities and bonds where the majority of the clients’ assets are already committed. SkyBridge Capital looks to produce returns with a volatility in the 5-7% or 6-8% range. The most important investment objective is the returns: “The returns pay the bills,” says Nolte. SkyBridge Capital looks at hedge fund investment strategies is a couple of ways, both of which feed into portfolio construction. The traditional buckets are global macro strategies (discretionary and systematic), event-driven (including activist, credit and M&A), directional equity (all long/short equity strategies), and finally relative value (which includes mortgage strategies, CB arb, and yield curve strategies). The two senior portfolio managers each specialize on two of the major buckets, and have more specialized analysts working under them. These are two of the four members of the portfolio allocation committee at SkyBridge Capital, as shown in Fig.1. As well as dividing the research effort along the lines of these big four strategy groupings, the portfolios are constructed along those lines at one level. Since the fund of funds manager wants to actively allocate, and therefore control exposures by sub-strategy as well as big strategy groupings, hedge fund management groups which engage in multi-strategy investing are very unlikely to get into the SkyBridge Capital funds. Nolte says that he would not be doing his job right if his clients were paying him to put the big multi-strategy names like Citadel and Och Ziff into his portfolio of funds. The second way of categorizing hedge fund investment strategies at SkyBridge is more unusual, and gives a different way of looking at hedge fund portfolios. There are three categories in this framework. First, cash-flow-generative strategies which naturally throw off cash without the managers having to actively do anything to produce it. Second, catalytic strategies are those in which managers put on positions to benefit if forecast events come out the right way. The third category is mark-to-market strategies from which returns come correlated to traded financial markets. Portfolios are constructed to bring a balance between these three categories of return stream, so that medium-term returns are less likely to be damaged by a market shock or credit shock. In the portfolio construction process Nolte and his senior colleagues use scenario analysis and stress-testing to test whether the portfolio will behave the way they expect it to behave in various scenarios. Like many fund of funds managers, SkyBridge Capital uses position-level data to feed into their risk systems. But unlike most of the competition, Nolte helped develop the system, which is offered by Imagine Software. This means that the risk systems are highly likely not just to support the rest of the investment process, but should be as close to an ideal fit as you can get. Nolte is keen to emphasis the collegiate nature of the investment culture at SkyBridge Capital. That thinking is put into practice first by having a portfolio allocation committee at all, and then by how it operates. According to Nolte it is better if the decision-making is not totally dominated by one person – “that is inherently risky, and can go to people’s heads.” In the discussions challenging questions arise – do we really want to do that, what about this caveat, or that conditionality? From testing the conviction level the decisions being made should be more robust in their background thought process. In this regard it helps that the three top decision-makers have worked together since 2005-6. Nolte adds, “We try to be disciplined about things that are not working. Plus, we always try to be self-reflective about how things are going and how the process is running.” All these elements add up to a collegiate and open investment culture at the firm. The mortgage security theme was enacted through non-agency and agency jumbo prime securities with pre-payment characteristics. Nolte and colleagues thought that pre-payments were going to remain low. This was a large, dislocated market reflecting home prices and related security prices that had collapsed dramatically. The mortgage-related theme was built up in 2009-10 to 40% of the NAV, and the theme stayed in place in that scale until 2012. It ran for a number of years, and got to a low of exposure of 14-15% late last year. By then it did not have outsized return potential but still had great correlation characteristics in relation to the rest of the portfolio, according to Nolte. The corporate credit theme took advantage of the wide credit spreads available after the credit crunch. This theme played out much faster than the SkyBridge investment professionals expected, as credit spreads had narrowed considerably by mid-2010. The risk/reward had become much less attractive, and by June of 2010 the theme was played out and closed. In 2010-11 Nolte and colleagues took exposure to a gold-related theme. Exposure to the theme grew to 10% of the book over the course of a year. When the gold price went parabolic it was taken as a warning, as that can be a sign of a top. Although SkyBridge Capital will usually scale out of themes they got out of the gold theme in a quarter because of the price action. A more normal course of action, having built up and ridden a theme, is to review how it has done and consider what might be changing that can impact it, in macroeconomics or the markets. Nolte and colleagues, having discussed it amongst themselves, take their thoughts to the managers who they are invested with to implement the theme. Nolte and colleagues might raise their concerns with the managers, and see what reactions they get. This means that when it is time to head for the exit the managers through whom they have been invested are mentally prepared for it. That is not to say that the managers will lose all the assets. One of the methods used by SkyBridge Capital is to use a cluster of managers to implement a theme – each will have different characteristics related to the theme, and, crucially for the portfolio construction process, will have a range of correlations to the rest of the universeof managers. In this context a correlation to other managers might be high at 0.8, and a correlation of 0.2-0.3 is low. A high correlation carries an inference of representativeness, and a low correlation carries an inference of a more idiosyncratic return profile. In the early stages of a theme, dependent on the characteristics of the rest of the portfolio at the time, more of the theme might be implemented through managers with high correlations to the universe. As the theme matures, once the easier money has been made, if you like, then SkyBridge will rotate to managers with more idiosyncratic risk (a narrower specialization with some juice left in it). For example the degree of hedging that managers use may be varied through time, or relatively consistent. In the early stages of a theme it may be beneficial to be with managers with low hedging (structurally or at that time), and later to migrate to managers who always carry hedges, or those that have started to express some caution through increased hedging. A simpler way of thinking about it is to say that the leverage in the fund (to a factor or to the underlying market) can be a control factor to the allocator. And this is where managers with a family of funds can come in. So the managers of the hedge fund management groups may not lose all the capital allocated as the lifecycle of the theme unfolds. The first stage of exposure may be through an ultra version of a hedge fund strategy; the mid-life of the theme might be enacted through the plain vanilla unlevered version of the strategy, and the mature phase might be played through a narrow specialist version of the strategy which still has a reasonably attractive risk/reward. Hence SkyBridge Capital staff can maintain a reasonable relationship with the owner of the underlying hedge fund firm even as capital is being redeemed in one part of the firm. In the period before Nolte arrived at SkyBridge Capital the firm was associated with the seeding of new hedge funds. Nolte does not see that as an attractive business at this point, because the market environment does not suit it. “If we were to do something in that space we might look at an emerging manager fund or at acceleration capital, but not at seeding,” he suggests.